Hall gets some exercize clambering about on the branches in his enclosure. 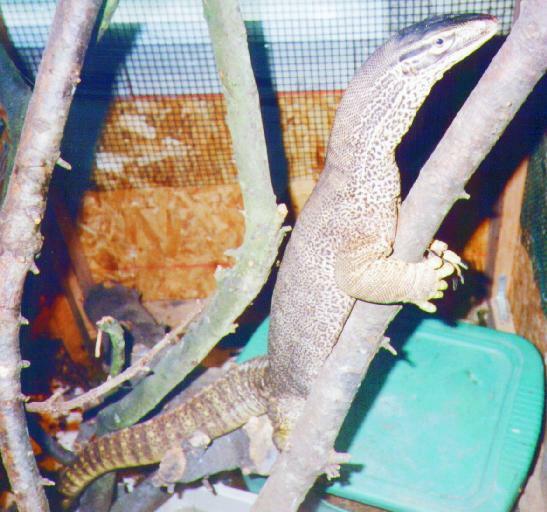 In my quest for a male argus monitor, I soon turned to sources outside the Seattle area. An add in Reptiles magazine put me in touch with a man by the name of Jim O'Dell from Arizona who had a male argus he was selling. I bought Hall sight unseen and had him shipped by air to Seatac airport. There were some delays due to the cold, but eventually I found myself picking up a very large box from the Delta cargo terminal. Perhaps the size of the box should have tipped me off, but I didn't realize quite what I had until I opened up the box at home. I sliced open the top of the box, cleared away the packing material, lifted up the top of the styrofoam insulating box, and opened up the bulging pillowcase to reveal a view of the most massive tail I had ever seen. It was at least as big around as my forearm. Pushing aside more of the pillowcase, I found the rest of the lizard matched the gargantuan proportions of the tail. I had bought a monster! Hall was so large I had no doubt that he could take off a finger with his bite. The day after I bough him, I went down to the hardware store and bought the heaviest-duty gloves I could find. They were thick leather welding gloves, reinforced with kevlar and padded. I still wasn't sure they would keep Hall's teeth away from my fingers, and was even thinking about getting metal plates attached to them. As with any new monitor, Hall was upset with having been moved and didn't like his new environment one bit. I picked him up and he hissed and thrashed until I was able to put him in the short term cage I had prepared for him, a cage that I now saw was far too small. I had to keep him quarenteened for a couple of weeks to ensure that he didn't spread any germs to my other monitors, but I didn't have any place to put him. With great trepidation, I ended up putting him in my bedroom for the duration of the quarenteen period. Fortunately, he was more scared of me than I was of him, and he ended up spending most of his time hidden in the closet. After about a week, he was eating, exploring, and knocking everything down. Eventually, when the quarenteen period was over, I let him into the living room with Chris, watching to make sure he didn't eat her. There was no problem, however. They got along just fine, and still get along to this day. They will share a basking site, sleep in the same burrow, and do not seem to consider the other a rival or a snack. After the first week, I suppose the initial shock wore off and Hall didn't seem quite as big as before. If asked about his size on the first day or two after I got him, I'd have said he was as big as an ocelot or a bobcat. Now that I can take a more objective view or his size, he probably isn't larger than a big housecat. The whole experience has given me some insight into people who claim they saw "monster rattlers" or "giant 50 foot pythons" or whatever, though. A psychological shock induced "size inflation" seems to be a real effect in the human mind. Hall is still a little leary of people. He does not like to be held, and will head for cover if you move around too much when he is out. You can feed him with a long pair of hemostats, or by picking him up and holding him so his nose is near his food. He seems to consider eating more important than getting away from the dangerous predator holding him! Otherwise, he seems to be doing fine, and has adjusted well to his new home. I have seen him courting and even breeding with Chris, so hopefully babies are on the way. Feb 22, 1999. 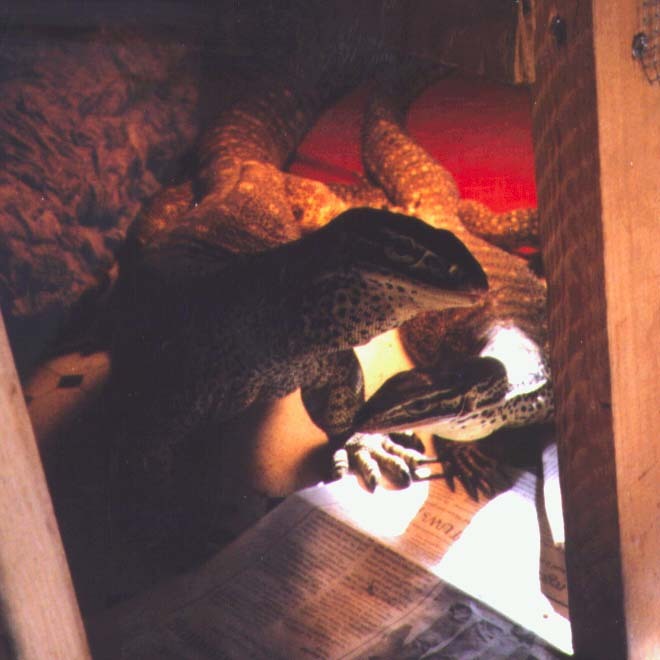 On a recent trip to Berkeley's East Bay Vivarium, I had the opportuntity to observe several other male argus monitors. None of them were anywhere near Hall's size. For whatever reason, Hall seems to be an unusually large animal. April 27, 1999. One of Hall's favorite past times seems to be looking out the window. He spends much of his time just gazing out into the wide world beyond that pane of glass. He did this in the old apartment, and since my recent move, he does this in his new cage as well, which is up against the room's outside window. Since the new cage has a wire mesh siding to a height of nearly 2 meters off the floor, Hall can climb up this and just hang out, seeing what is going on outside. He probably keeps my neighbors entertained. Some argus monitors seem to be unusually prone to ripping off their claws. Medea was one of these, so is Hall. Of his original 20 claws, he only has 9 left. The old ones he ripped out are all growing back, except for the the most recent injuries. Chris and Merrimac still have all of their claws, and Oz is missing only the claws on the longest back toe on each foot. May 7, 1999. My new housemate keeps and breeds large numbers of Guinea pigs. Sometimes, one of these dies, and I, or rather the monitors, get the remains. The first time I tried feeding a Guinea pig to Hall and Chris, Chris attacked it but had a hard time getting through the thick skin and all the long hair. By clawing and shaking, she eventually managed to rip through, but it took a long time. Hall wasn't much help. He was too timid when Chris was flinging it about, and was missing too many of his front claws to effectively dismember it. I left the carcass in the cage while I went off and did other things. It turns out that the monitors eventually got tired of trying to separate off bite sized bits and just left most of the remains sitting on the heat mat underneath the basking light. By the time I got back, the place stunk to high heaven! The next time I gave them a Guinea pig carcass, I skinned it, cut off the head (which is to big for an argus monitor to swallow), and butchered the rest of it up into bite sized pieces. The heart, lungs, and guts were stripped out and thrown to Hall and Chris, then the legs, sections of the rib cage, the lower back, and the hips. All of this was enthusiastically and messily devoured. After this feast, Chris and Hall were so bloated they didn't want to eat for a day afterwards. Hall helps with the cleaning. Hall and Chris hang out together. 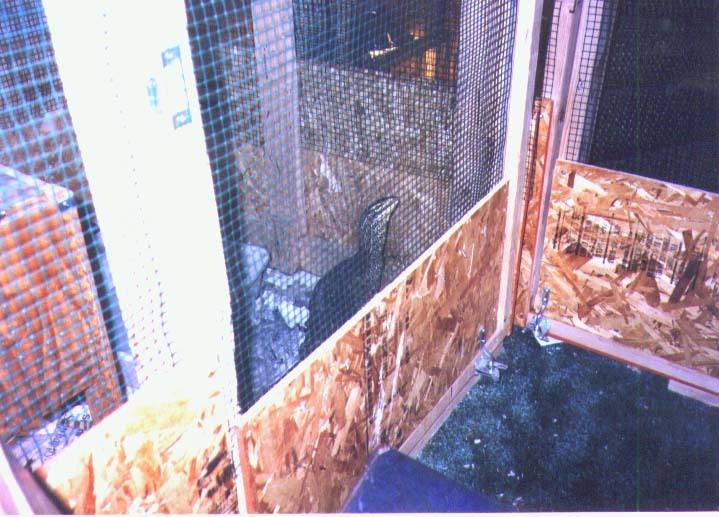 Hall in his and Chris's enclosure.